Ancient temples were considered to be the residence of the god. 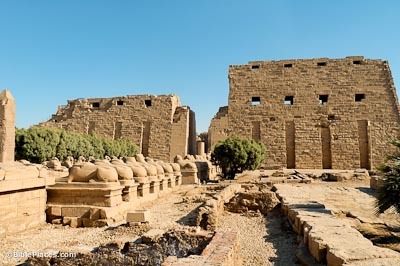 The Karnak temple was the dwelling place of Amon-Re, his wife Mut and their son Khonsu, the moon god. Construction continued on this temple for more than two millennia under the belief that once building ceased, the temple “died.” The temple was a closed compound, open only to the priests and the pharaoh. The common people could only enter the courtyard. 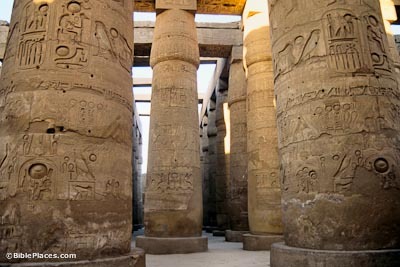 Consisting of 134 columns, the hypostyle hall was started by Seti I, but the majority of the construction was done by Ramses II. The center columns are taller than the others, and the windows would allow light to come in. This hall may have been similar to Solomon’s “House of the Forest of Lebanon” (1 Kgs 7). In Thutmose III’s city lists, hundreds of princes are depicted with hands tied behind their backs and their cartouches on their shields. 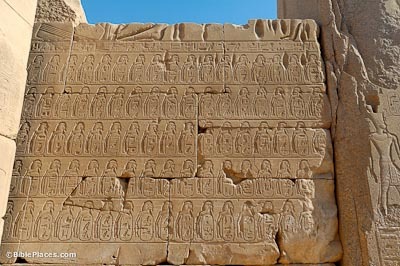 This is a depiction of the rulers of the cities of Canaan that Thutmose III captured when Megiddo fell. 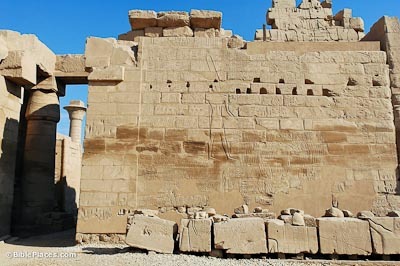 All the rulers, except the king of Kadesh, were trapped in Megiddo, and so by the capture of Megiddo, Thutmose could say that it was as the capture of a thousand cities. At Thutmose’s death the Egyptian empire stretched from the Euphrates to the Fourth Cataract, the greatest extent of Egypt’s territory ever. 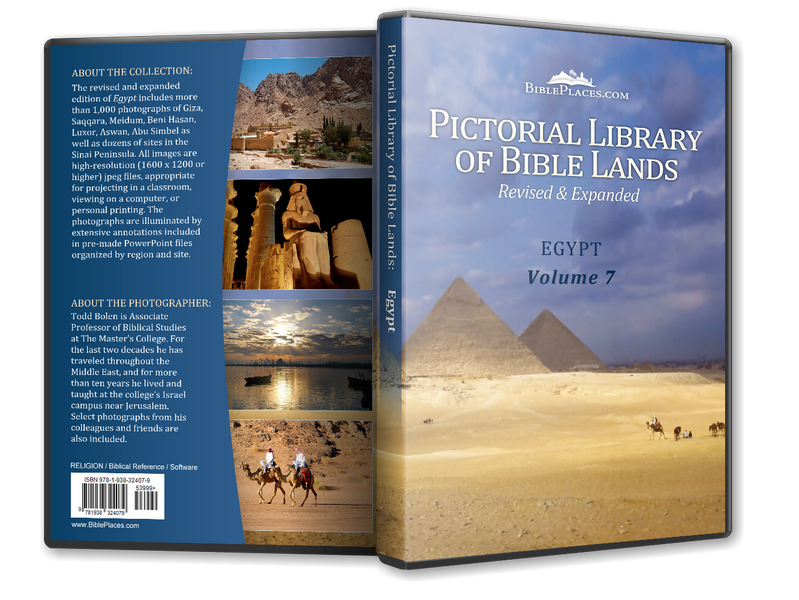 Ramses II’s treaty with the Hittites is one of the most important treaties in history. 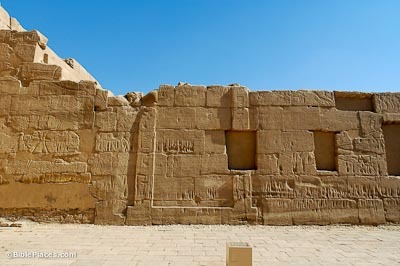 Originally written on silver tablets in Heliopolis and Hattusus, a copy was found here on this wall in the Karnak Temple. After years of inconclusive battles between the Hittites and the Egyptians, Ramses II and the Hittite ruler concluded an agreement by which Syria and Canaan would be divided between them. On either side of this text are depictions of Merneptah’s battles in Canaan, including those against Ashkelon and Israel. Pharaoh Shishak (945-924 BC) invaded Israel and Judah in 925 BC and carried off the treasures of Jerusalem’s temple. The Bible records the attack from Judah’s perspective (2 Chr 12), but Shishak’s list gives much greater detail including the names of 150 cities, most of which cannot be located today. Scholars debate how to read this inscription, but most agree that the following cities are mentioned: Taanach, Beth-Shean, Rehob, Mahanaim, Gibeon, Beth-Horon, Megiddo, and Arad. 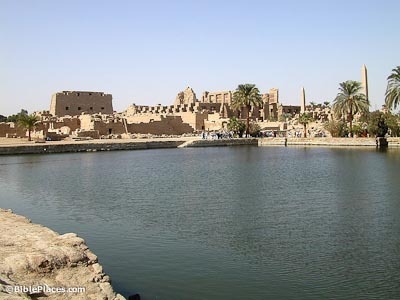 Every Egyptian temple had a sacred lake, and the one at Karnak Temple was the largest. Used daily by the priests for purification, the sacred lake was also used in festivals during which images of the gods would travel across the lake in boats. The lake measures 130 x 77 meters and was surrounded by storerooms and homes of the priests.